The Craftside blog has been amazing - for the second time now, I have won a book, and again I didn't know I was even in a contest. I couldn't be happier with this win. This book will make for a great addition to my collection! 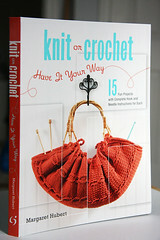 Thank you, Craftside blog and Rockport Publishers! Sweet! Unexpected too?! That's great, enjoy. Well, congratulations! Isn't it nice when we get an unexpected prize? Great gift! I love the purse on the cover of that book! Thanks, everyone. Not sure which will be my first project, but you can bet I'll post something here once I start it.